Ending your alcohol problems isn’t rocket science, voodoo cults, magic bullets, pixie dust, labels, slogans, “90 meetings in 90 days”, or months in expensive “rehab”. It’s discovering what you are using alcohol for and designing workable solutions for problems you are self-medicating. As with most of the behavioral issues we meet in life, the description is pretty straightforward – it’s the alternatives that are hard to find, organize, and implement. An example? Troubled by obesity? Eat less. Easy to say. Very tough to do. Happily, it’s a whole lot easier to quit drinking than it is to change our dining preferences. But it still takes some detective work, motivation, interest, and skill – which is why traditional treatment programs don’t work. After all, real solutions require competent, experienced, and skillful help. But, good help costs more than the relapsing paraprofessionals the treatment industry employs. Ready for real help from real professionals who, like you, are successful, intelligent, capable, and interesting individuals, too? Good! Let’s get your uniquely designed show on the road and you off the alcohol. 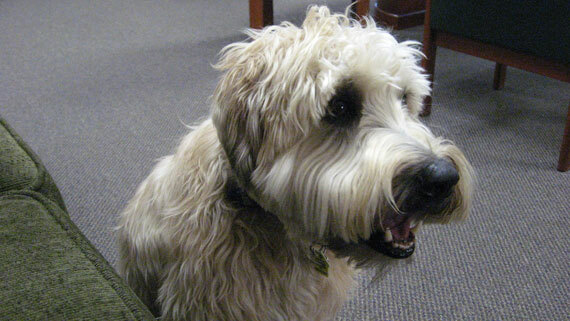 Our intern “canine therapist”, Scruffy, is a new addition to our office. Most days he guards the perimeter and dozes under the table. As a Wheaton Terrier he will be pleased to welcome you with his “Wheaton Greetin’ “. He’s very sensitive and has a soft spot for anyone in distress (and he loves to lick toes). A non-shedding and hypo-allergenic breed, he is a highly skilled and somewhat trained addition to our team and yours! You can learn more about Scruffy by calling! Now!